Do not go in to Holy Motors asking questions like “who”, “what”, “where”, “when”, “why”, or “how” because to do so is to shoot yourself in the foot – or, in a more film-appropriate analogy, to chew your own fingers off. Monsieur Oscar (Denis Lavant) is an important businessman. We see him leaving his large home as his wife and host of daughters wave him off and tell him to “work hard”. He passes a fleet of cars and walks down his winding driveway until he gets to a stretch limousine and greets his driver Céline (Edith Scob). * As they get on the road, Céline informs him they have nine appointments that day, and the file for the first is next to him. He makes some phone calls, arranges for guns to be bought for his bodyguards in response to a death threat, and then brings out a long, grey wig and starts brushing it. The next time we see him, he is stepping out of the limousine convincingly dressed as a wizened, hunched old woman. The film follows Monsieur Oscar as he attends these “appointments”; seamlessly fitting in to multiple, well-established parallel lives. He is a father, a monster, a stunt performer in motion capture. We don’t know why, or who is calling the shots. Hints are given, but these mostly serve to just prompt more questions. Maybe it’s all a big show; maybe everyone is dead. Maybe there is no reason at all. Either way, the result is a beautiful, baffling and at times hilarious film which makes you think outside the realms of logic. It also has an accordion interval, something more films definitely need. This is at heart a film about film, and while even simply saying that makes me want to use the word “meta”, run a comb through my ten-inch high hair helmet, and let my soy double shot mochaccino fog up my just-for-show glasses, writer and director Leos Carax manages to do this without coming across at all pretentiously. Each “appointment” takes the format of a different genre or type of film; it is like a series of shorts linked together to form an overarching feature tied together through the chameleon-like Monsieur Oscar. Each short could probably stand alone; one features Eva Mendes as a “Beauty” to Lavant’s “Beast”, while another has Kylie Minogue sporting the eyes of a doomed air stewardess. There is contortionism, computer generated imagery and doppelgängers. Singular goes to parallel, then the parallel begins to overlap and logic becomes a thing that you checked in at the door before finding your seat. Despite all this the main feature isn’t the “big picture”, with the film opening on a shot of Carax getting out of bed and finding a hidden doorway in a wall, leading him in to a theatre of seemingly apathetic, staring people all fixated on a screen. 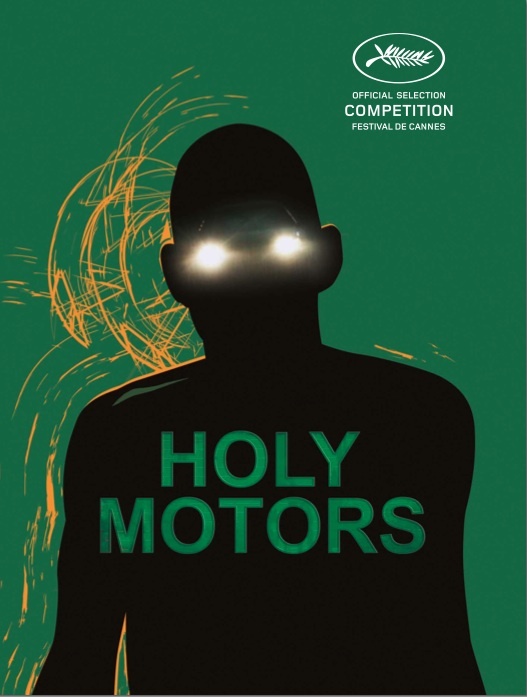 Holy Motors is crazy, original and will mess with your mind – in a good way, and only if you let it. So, if you only have room in your schedule or heart for one film about a man riding about town in a limousine – pick this one. This entry was posted in Film, Reviews and tagged Denis Lavant, Edith Scob, Eva Mendes, Holy Motors, Kylie Minogue, Leos Carax. Bookmark the permalink.